Weathernews Inc. releases new cumulonimbus development detection content using Himawari 8 satellite data to support more efficient flight planning – Weathernews Inc.
Weathernews Inc. (Head Office: Chiba, Japan, CEO: Chihito Kusabiraki) commenced practical application of the Himawari 8 satellite imagery on July 7th, and released aviation weather support content which detects cumulonimbus cloud development in real-time. 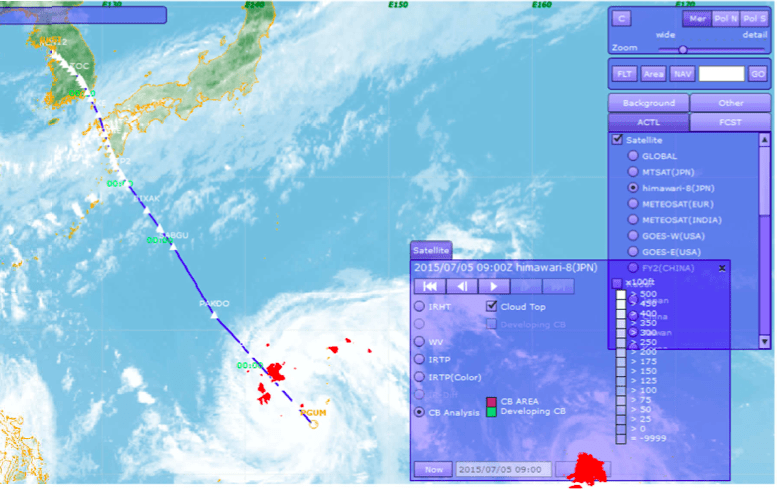 This new content is now available on FOSTER NEXTGEN, an aviation weather software for aircraft operators and will support decisions in selecting the optimum flight route and altitude which avoids areas of convective development as well as cumulonimbus clouds embedded in tropical cyclones. On average, 20-30 tropical cyclones form each year that affect the airspace over the western North Pacific and Southeast Asia. The airspace information regarding developed Cb clouds associated with tropical cyclones is issued at most 1-2 times per hour by each nation's weather bureau. Therefore in order to ensure safety, there are many cases of aircraft flying very far outside of the cloud region of the tropical cyclone. In order to protect the safety of the passengers during inclement weather yet minimize delays and fuel expenditures, one of the most important issues for airlines is selecting the optimum flight path for their operations. 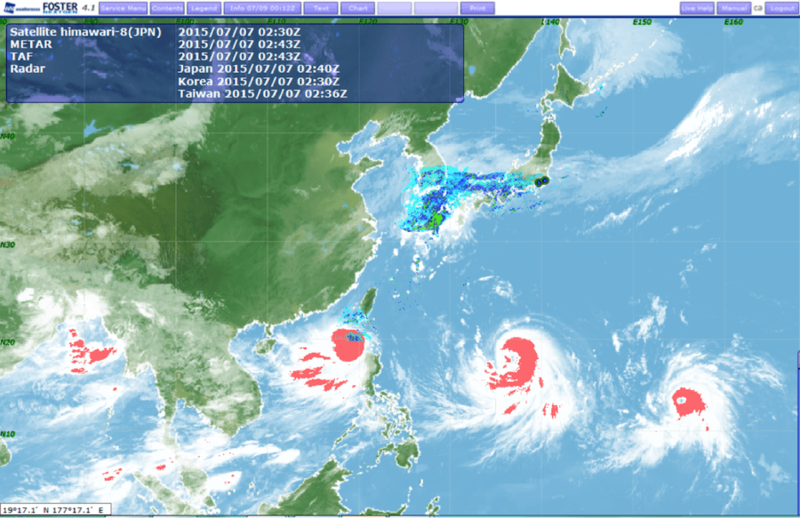 With the new Himawari 8 satellite imagery, Weathernews Inc. is able to monitor convective development around Japan every two and a half minutes, and other regions within the range of the satellite, every 10 minutes. New content that advises the risk of cumulonimbus cloud development en-route can now be released with this capability of real-time monitoring of convective development relative to a specific height. This new content is now available on FOSTER NEXTGEN. Users will be able to analyze the risks associated with cumulonimbus clouds along the flight route as the flight information is superimposed over on a map along with the new content. Developing cumulonimbus clouds associated with tropical cyclones, tropical depressions, stationary frontal boundaries can be analyzed in Asia to support safe operation of flight. In addition, Himawari 8 has more spectral bands from which differential analysis of various images can lead to more effective detection of volcanic ash, dust and fog.